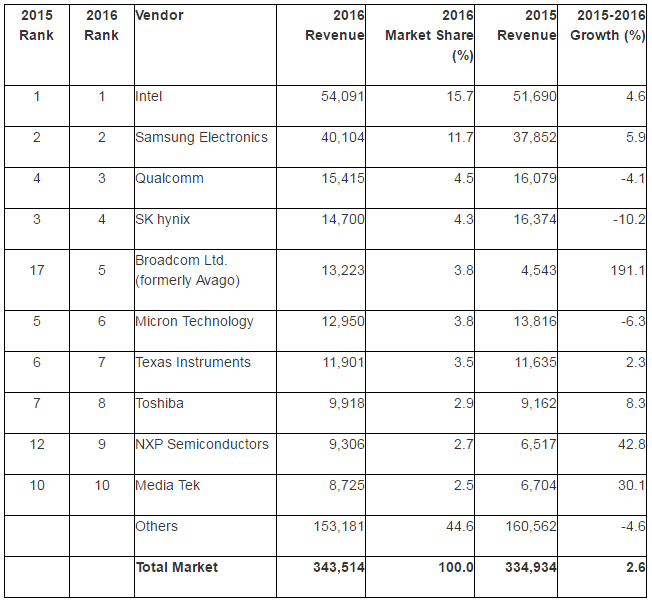 Revenues in the worldwide semiconductor market have taken a 2.6% step upwards, with Intel and Samsung stretching their lead at the top of the table. According to Gartner, total revenues for the segment increased to $343.5 billion over the course of 2016, with Intel taking a 15.7% slice of the market share, and Samsung accounting for 11.7%. The pair grew by 4.6% and 5.9% respectively, but the news was not as positive for Qualcomm, which saw its own revenues decline by 4.1%. This is a worrying sign, but the ongoing dispute with Apple has the potential to cause much more damage in the long-term. “The semiconductor industry rebounded in 2016, with a weak start to the year, characterized by inventory correction, giving way to strengthening demand and an improving pricing environment in the second half,” said James Hines Research Director at Gartner. The largest mover in the market was Broadcom, which jumped up 12 places to fifth in the worldwide market share rankings, though this was primarily due to acquisitions. Avago Technologies acquired Broadcom Corp before rebranding to Broadcom Ltd. The new organization saw an increase of 191% year-on-year, now accounting for 3.8% of the global market share. “The combined revenue of the top 25 semiconductor vendors increased by 10.5% during 2016 and accounted for a 74.9% share, outperforming the rest of the market, which saw a 15.6% revenue decline,” said Hines. While Intel has been facing a tough time in recent years in a search to reinvent itself, not many will complain about 4.6% growth across the year. Its traditional stomping ground will continue to be a cash generator, but a couple of big bets on the autonomous vehicles race could hold some fortunes for the team. It certainly is a sensible bet; the complexities of a self-driving and self-aware car, which is being tasked in making its own decisions in a fraction of a second, the requirements from companies like Intel and Samsung will be high. “Just as you need different clubs to get you through 18 holes of golf, you need different kinds of processors to ‘drive’ an autonomous car,” said Kathy Winter, GM of the Automated Driving Solutions Division at Intel.